You guys sick of seeing this tee shirt yet? Well, clearly, I'm not. I told you on Monday about how I hadn't been into an Old Navy in forever. This was another thing I picked up in addition to Monday's dress. It's making its rounds on Instagram, but I couldn't resist it. I bought a couple of other graphic tees from Old Navy last year (seen here and here) that I wear a ton, so I knew I would leave the store with a new one last weekend. And here it is! I figured I'd camouflage the saying tee a bit with this buffalo plaid top. When I walked out of my closet room, the husband abruptly said, "WHOA! Lumberjack!" Uh, ok, I'll take that as a compliment? I love this top, and I'm glad I bought it. It's worth all the country bumpkin comments I'm sure to get! Regardless - I am looking forward to styling it again and again and again. Wearing this button up, I did get taken back to my younger years when I wore my flannels, except back then I wore Doc Martens and not heels. I definitely prefer the heels - you guys know I love pairing casual with dressy. Edgy with girly. Basically opposites with opposites. I see this shirt being one of my go to tops to throw on in a pinch. So, I apologize in advance for how many times you will be seeing this. And that means you should just go ahead and buy it now because eventually it will grow on you, and I would hate for it to be sold out by the time you realize you've always loved it! You're welcome. 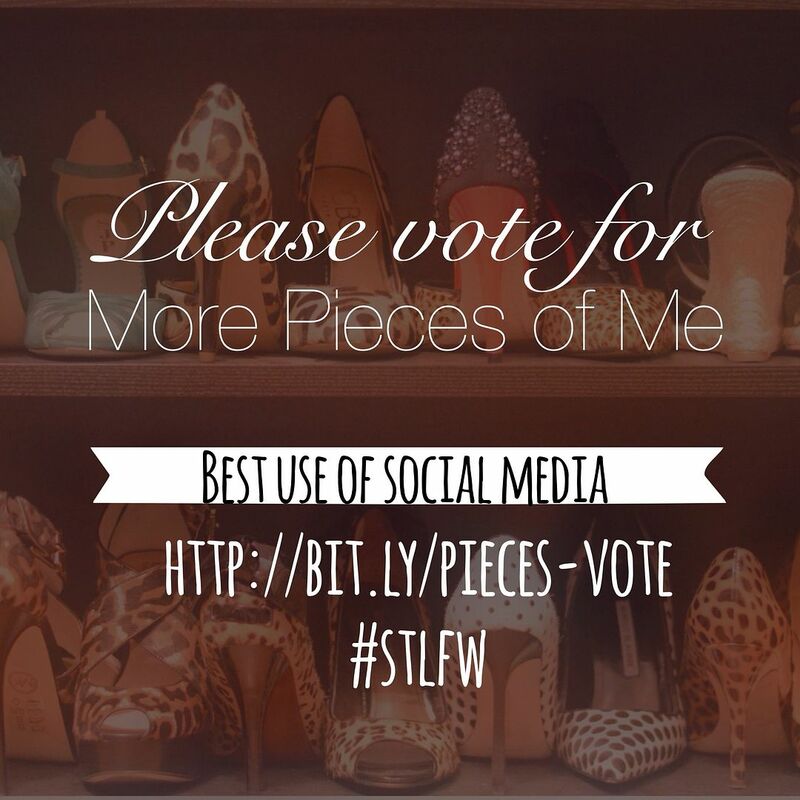 Before I go - just wanted to let you know that More Pieces of Me has been nominated for a St. Louis Fashion Blog award for "Best Use of Social Media." I would be forever indebted to you if you would take a minute to vote for me here. It's category #6! Voting is open until September 19th, so please tell a friend! You are allowed one vote per email per day from now until the 19th, so if you vote for me every day - just WOW! And if you're not sure you agree with the nomination, why dontcha follow me on Instagram and Facebook and see for yourself! Thank you guys for the support and for the nomination. It's been such a fun year with you all and I'm excited for more! Congrats on being nominated! Just voted for you! 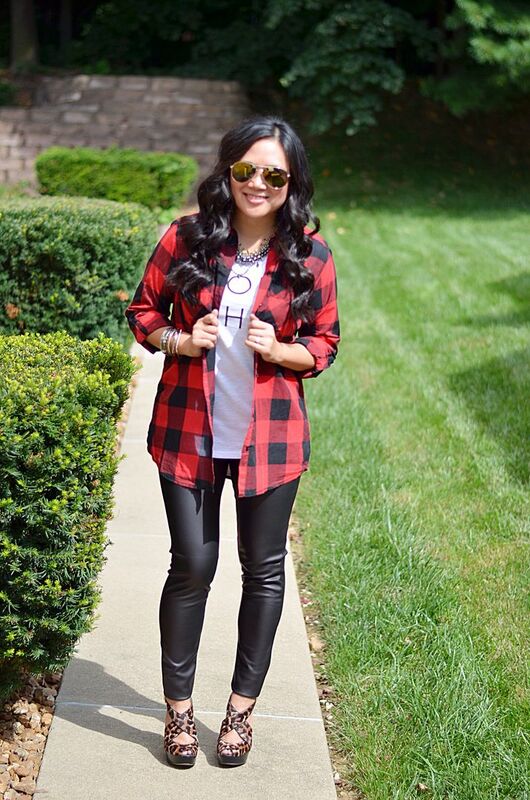 Love your buffalo plaid with the graphic tee and leopard! 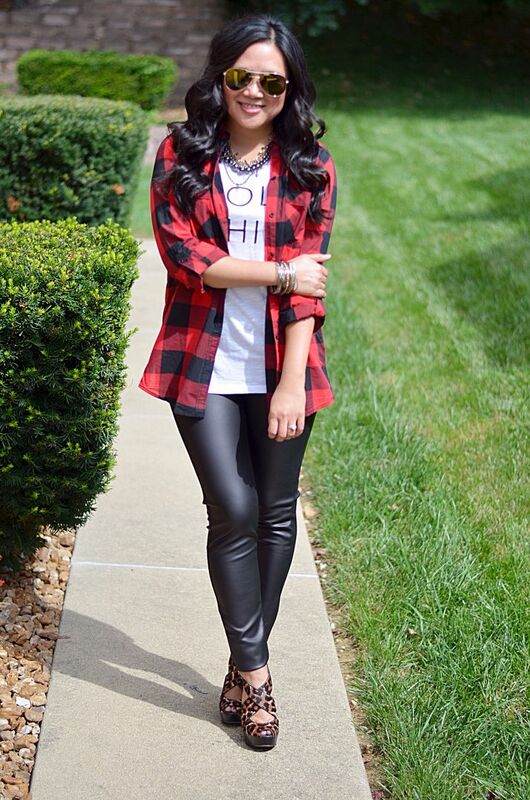 Such a perfect fall look! Thanks so so much for the vote! And this may be one of my all time fave look! The scuba leggings just make everything better! Congrats on the nom- headed over to vote for you! That's the only plaid I didn't get and I wanted to so badly, you look awesome in it. OMG get it girl! It's the best! You will love it!!! I'm so bummed I missed out on this shirt!!! Love how you styled it. Congratulations on the nomination!! I hope you happen to stumble upon it! I hope you can find a good dupe and/or I hope this goes on major sale for you! I have a feeling I will wear it a ton! I love plaid and a sequin skirt. 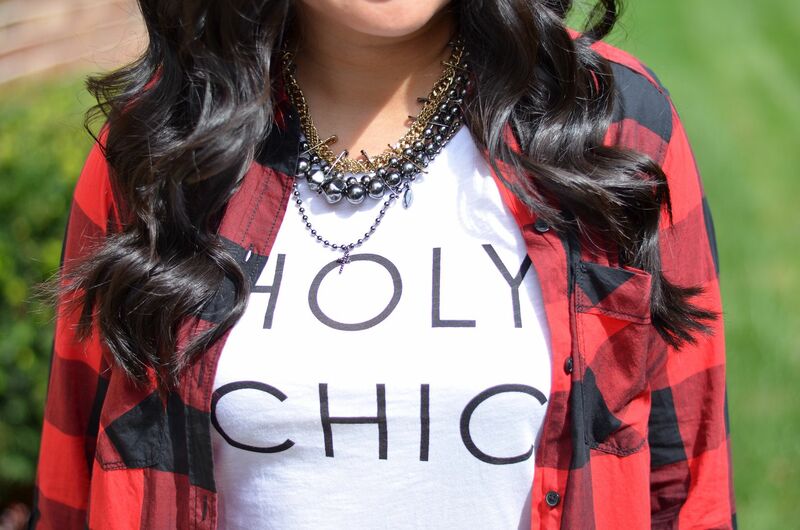 Casual + dressy is the best combo! I want this whole look! This post has me so excited for plaid! You and me both! Hah! I have a buffalo plaid shirt coming my way, and I could not be more excited! As you have shown, it's the perfect piece. Yay!! I can't wait to see how you style yours! 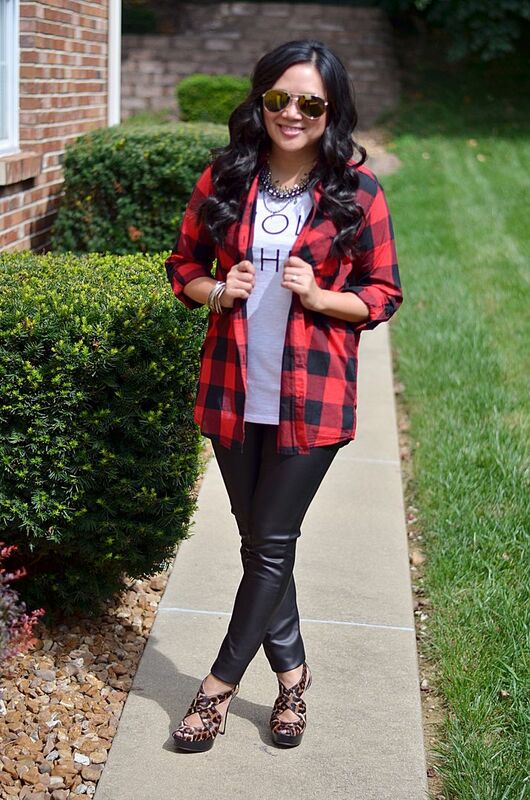 I so wish it was cool enough here to wear my faux leather leggings! I am loving the buffalo plaid! it's crazy that it dropped 20 degrees here! Though it will creep up a little this week! I can't complain though, it was great to whip these babies out! I will be living in them come fall! Great outfit, loved this post!!! Just voted! Good luck! I really like this outfit and the 3 you styled below. I'm really liking the 3 ways feature you've been doing recently! And yay - I'm glad you enjoyed it! I will have to sneak these in from time to time! I looooooved my docs!! So funny. I can't imagine wearing them now! I voted - I only entered a vote for option #6 because I didn't know any of the other blogs at all! Luckily I didn't have to fill in the whole form to cast my vote. Good luck! Thank you!! I don't think you have to fill in the whole form. I appreciate you doing it!!! Woohoo! Congrats lady! Love buffalo check! J.Crew came out with a blue check and it is on my list to purchase! Thanks, girl! And man, I need to check out the blue version of this!